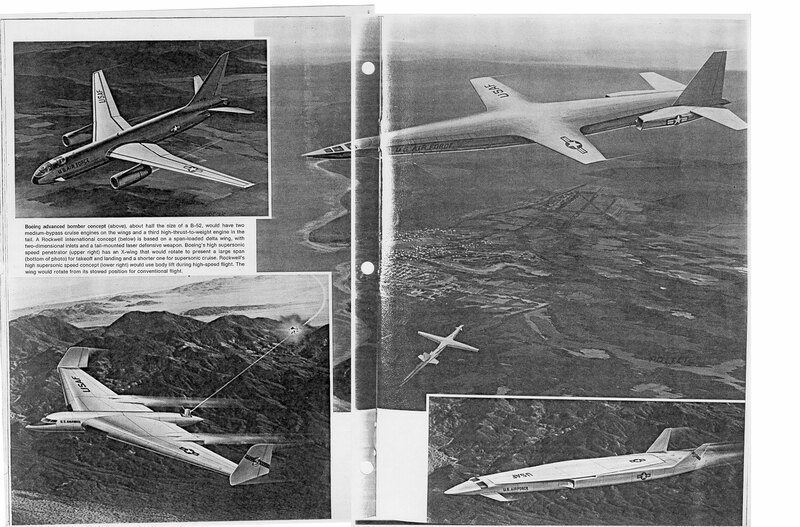 These are advanced Boeing Bomber Studies from the late '70s. Except for the two Rockwell design, which I left in due to the two page Boeing 'X-Wing' Bomber design. I think that one on the right hand page was an oblique wing design (can't remember from who) where the wing rotated to be flush with the fuselage leaving a very slim and flattened lifting body design with twin fins. There's a Rockwell design of that description on the Right-hand side of the scan (there should be a scroll bar below the image). Just how fast was it supposed to go to generate sufficient lift? Scroll bar! Dammit I keep forgetting about that on the larger images!! BTW, I'm using Firefox, for your ref. And *where* did those side views come from? Note: the Rockwell strategic bomber side view has errors. The main wings had positive dihedral. I've seen another shot of that one in which it has a negative dihedral. Not saying you're wrong just that somehow the impression got out there that it was negative. Seems that its this one. But still artists impression. Better argument should be blueprint. This one has surely a negative dihedral, but I suspect Scott has a real three views. If you want, I will add more pictoriial info to Rockwell studies thread. Thanks Flateric, and I think I speak for all the forum members! Please, please, please, mighty Lark, give us higher-res scan!!! Fixed the thread (and on holiday too! - luckily some people don't secure their wireless very well) for you. Sundog, the image you are posting is 1250x1624 in size, when the server tries to resize it down to thumbnail size it decompresses the jpg and then runs out of memory. I can't change the settings on the current server, so best to reduce the resolution. Saving it as a lower quality jpg doesn't help. Problems caused by posting large, hi-res scans are described by Overscan two messages above, and all of us could watch the fruitful results of this for about a day. I still eager to see what that large Sundog tried to show us - I bet it was something very interesting as always. I personally didn't know about pixel size limitations of images, and will be more cautious. If you want, you can just ask Skybolt to post it via e-mail, he surely will be able to help. Sorry about that, as soon as I get home (At the office now) I'll make it smaller and repost it. OK, I replaced it with a small image and a link to the larger one. If the first image is too big I'll make it smaller as well. In the future, I'll make big images with links and small preview images, unless the image is small to begin with. Any chance of a higher res version of the 3-view of this proposal? For that matter, is there a full 3-view of the more convetional swept wing, twin engine plus booster design? Some of those Boeing designs could still be viable today- given an environment with almost zero air threat (Afghanistan, Iraq) an efficient "bomb truck" loaded with LGBs and JDAMs could orbit in patrol areas "on call" to ground units that are engaged with insurgent forces. There is a recent article in the latest issue of AWST that talks about discussions at the Pentagon for a close-support aircraft more geared to COIN warfare than the current high-tech legacy systems in use. The article talks about smaller aircraft, but the current generation of sensors and precision weapons I see no reason right off hand why a larger "bomb truck" type aircraft couldn't do the job. I think it's a bummer they didn't build 713-1-138. Think super-sized B-52 with four twin-engine nacelles under each wing instead of two. I'm about 99% certain 713-1-138 wasn't LH2 fueled and if it was it didn't carry very much because it didn't have the Goodyear-blimp look of most LH2 aircraft. It simply looked like a scaled up B-52. I've never seen this 713-1-138. Did I miss a drawing or can someone post one? Thanks! However, if it's in the Valkyrie book, I'm pretty sure I have it in my stash at home. I can look it up then. I guess I haven't seen my copy in a couple of years. 'm about 99% certain 713-1-138 wasn't LH2 fueled and if it was it didn't carry very much because it didn't have the Goodyear-blimp look of most LH2 aircraft. It simply looked like a scaled up B-52. Anyway, not all the liquid hydrogen projects were blimp-like. Think ot he L-400 Suntan, or, in the WS-110A studies, the Boeing 725-101. Pometablava: see message above about image sizes. The current web hosting has a memory limit on PHP code which causes problems with the thumbnail creation process if the pixel size and colour depth of the image combine to exceed the limits. 1) Try not to exceed 1024 pixels in either dimension. 2) Save greyscale images as greyscale JPEGs not colour ones- they use less memory to resize then. If your image is too large (say, 2000 x 1000), then even saving it as 5% quality for a 20kb file won't stop the error message. Please note that, generally speaking, 1024 pixels is large enough for a reasonable quality image.